If you do not feed pigeons, you allow the animals a step to welfare living conditions! The feral pigeon is descended from the rock dove. Due to the favorable conditions of the habitat "city" - a relatively mild climate, plenty of food through the garbage of prosperity and feeding, absence of natural enemies such as Goshawk, peregrine falcon, unnaturally long winter days and advertising light - there is a large increase in the feral pigeon in cities. According to a study of biologists from the University of Basel every feral pigeon produces about twelve kilos of droppings per year, resulting in odor and aesthetic impairments. Pigeon droppings decompose stones and concrete; and can contain more than 100 pathogens, but most are harmless to humans. The pigeons defecate preferred at their resting and breeding places - that fact uses the "Ausgburger Modell". In supervised pigeon houses the pigeons can specifically located, directly controlled and their population can be regulated. If these houses meet all ideal conditions, the pigeons from the surrounding areas are going there. In addition, previous nesting sites will made inaccessible. Accompanying the food supply is reduced, feeding zones remain for human-pigeon interaction. Projects in Basel, Tübingen and Berlin show that in this way the pigeon problem can be sustainable, environmentally and animal friendly addressed. 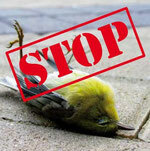 In addition, the building destruction is reduced and the pigeons stock can be reduced in a few years by a third. The goal should not be the extermination of the pigeons, but a small stock of healthy pigeons, because pigeons belong to the biodiversity of our settlements. ...they can raise up to 10 juveniles. Must pigeons search for their own food, their energy and time reaches only for 2-4 year juveniles. ... rats also benefit from the feed. 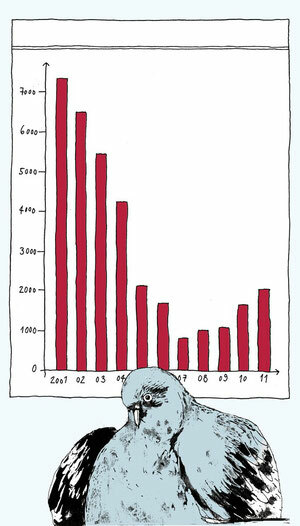 A pigeon produces 12 kg feces per year. The uric acid of the the feces corrode metals and erodes rocks. The odor increases and balconies and facades are getting dirty. 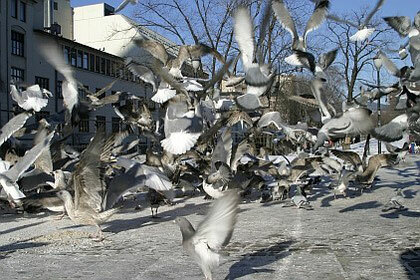 Various pathogens (including salmonellosis) can be transmitted by pigeons and pigeon droppings to humans. It can also be triggered allergies. Children and weaker immune people are particularly at risk. feeding prohibition in Hamburg, Duisburg, Cologne, Lahr, Sinsheim, etc. 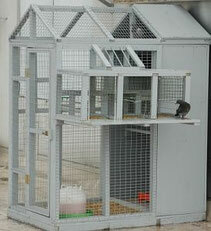 Example for the reduction of the pigeon population with the help of campaigns and pigeon houses in Lucerne.